Reference number for this case: 29-Sep-54-Landéda l'Aber-Wrach. Thank you for including this reference number in any correspondence with me regarding this case. BREST. -- The residents of Landeda and L'Aberwrach (Finistère) yesterday evening saw at high altitude a machine of circular shape and resembling a "flying saucer." For a few days, testimonys of people claimimg to have seen mysterious luminous objects in the sky have arrived from all the corners of France. The inhabitants of Landeda and Abereac (Finistère), saw, Wednesday evening, at high altitude, a machine of circular shape. Full article transcription and scan available here. BREST, september 29. -- The residents of Landeda and L'Aberwrac'h (Finistère) yesterday evening saw tonight at high altitude a machine of circular shape and resembling a "flying saucer." The author indicates that on Wednesday September 29, 1954, a luminous object was observed in Landéda L'Aber-Wrac'h, seen in a vast perimeter including several villages. He indicates as sources the newspapers "Combat" and "Le Télégramme de Brest" for October 1st, 1954. 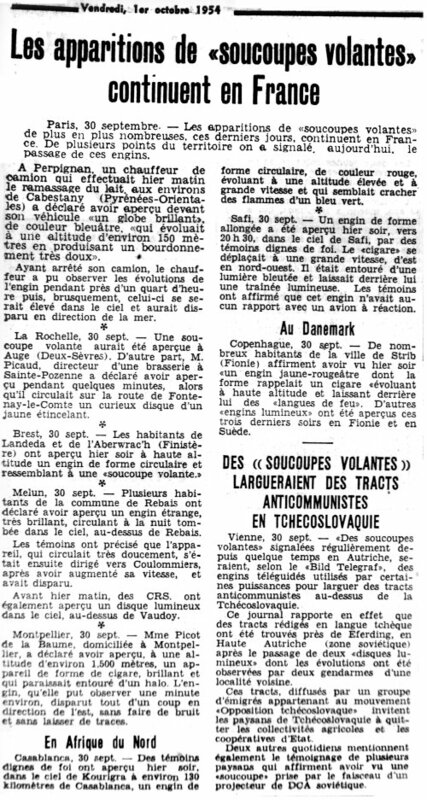 Luc Chastan indicates that in Finistère in Landéda on September 29, 1954 at an unknown hour, "The residents of Landéda and the Aber-Wrac'h observed an object." The website indicates that on 29 September 1954 at 19:00 in "Landeda.Aber Wrac'H", France, "An unidentified object was sighted, but with appearance and behavior that most likely would have a conventional explanation. One object was observed by numerous witnesses." Testimony nr. FR 29 870 1954 09 29 .. ..
Not looked for yet. Possible meteor or plane. 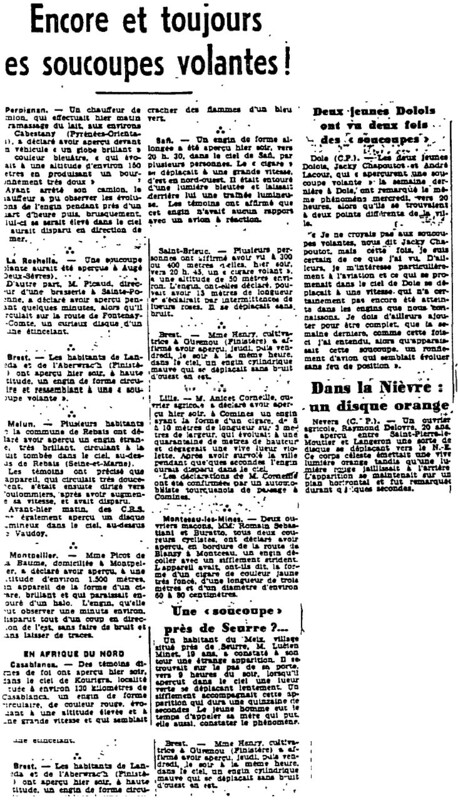 [tb1] Article in the regional newspaper Le Télégramme de Brest, Brest, France, October 1, 1954. [co1] Article in the national newspaper Combat, Paris, France, October 1, 1954. [jb1] "Fantastiques Rencontres au Bout du Monde", book by Jean-François Boédec, page 13, 1982. 0.1 Patrick Gross March 15, 2006 First published. 1.0 Patrick Gross February 18, 2010 Conversion from HTML to XHTML Strict. First formal version. Additions [lc1], [ud1]. 1.2 Patrick Gross July 26, 2010 Addition [vm1]. 1.3 Patrick Gross September 30, 2014 Addition [ub1]. 1.6 Patrick Gross February 7, 2017 Addition [vo1].